"I will not allow sabotage, I'll simply rip heads off," is never something you want your boss to say. Russia is in the process of building its first new cosmodrome — or rocket launch site — since the fall of the USSR. And it's in a right old mess. For the past two decades, Russia's used the Baikonur Cosmodrome, in current-day Kazakhstan, which dates back to the very earliest days of Russian space flight. 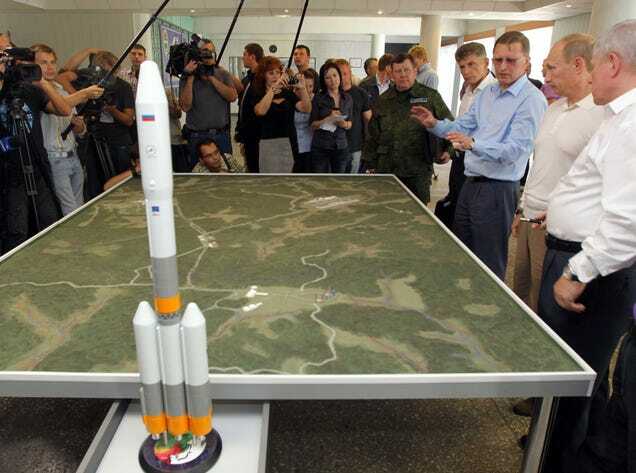 But not only is that launch site ageing, it's also a political bee in Russia's bonnet. So Russia is building a new cosmodrome thousands of miles east, nearly on the border of China, where it'll be able to operate without paying Kazakhstan, as well as perks like being closer to the ocean, which will make landings easier. The $2.4 billion Vostochny Cosmodrome was started in 2011, and it's supposed to be done in 2018. With the blessing of Putin and seemingly unlimited funds, what could go wrong? A lot, actually. Then there's our old friend: wild, unchecked corruption by construction officials. Last year, the construction manager was arrested for embezzling millions of dollars from the project. Russia's Deputy Prime Minister, Dmitry Rogozin, was brought in to clean things up — he even installed cameras at the sites to catch any "slacking". But last week, Moscow Times/a> reported that the project was in trouble again, saying that it faced "having its electricity supply cut over unpaid bills". That's when Rogozin made his decapitation threat, saying, "I will not allow sabotage, I'll simply rip heads off," and adding that "those who try to steal the people's money from the spaceport will be locked up. We will build this cosmodrome."